This guide describes which Generation I, II and III Candy and perfect IV Pokemon you need to save in order to be 100% prepared for when Generation IV becomes available. Make sure to also read through our analysis after the table. P.S. this guide is also available as a portable, mobile friendly info graphic (link). If you like it, feel free to share this with your local community. If you’re into researching Pokemon GO and discussing future meta changes, hop on over to our Discord server (8k members, 3 weeks old at the moment of this writing). Gen IV will bring a lot meta changes to Pokemon GO, especially for Ice and Grass types. Let’s dive into the chart above. Rhyperior – where will you land, oh mighty one? Let’s address the elephant in the room. Rhyperior looks like a massive hulking giant that should be capable of destroying every other Ground and Rock type out there, right? Well, that’s not really the case at least not for Ground types, as a level 28.5 Groudon has better stats than a fully maxed out Level 40 Rhyperior! That’s a lot of saved Stardust for the same level of performance. 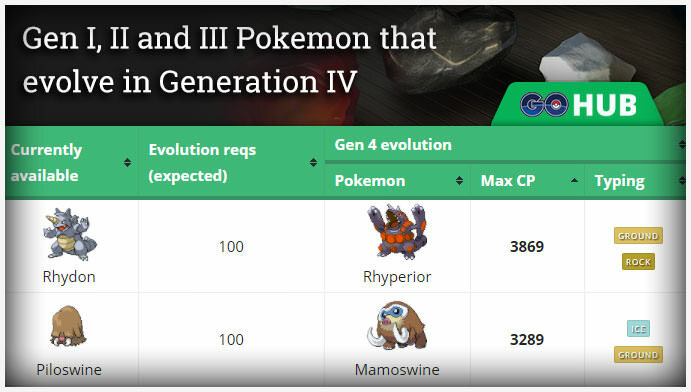 However, when compared with other Rock types, Rhyperior will perform better than Golem and Rhydon, but we’re not sure how it will fare against Tyranitar, especially at the time when most players have a number of high level Tyranitars and there better options for spending Stardust. Grass types – the curse has lifted! Tangrowth, with it’s massive 3110 CP and expected access to Solar Beam, is expected to become the one of (if not the) best Grass types in Pokemon GO. Although it has lower Attack than Exeggutor, the added bulk (hefty 200 stamina!) makes Tangrowth the “Hariyama of grass types” – bulky, powerful and useful. Leafeon is in a weird spot. It has a solid attack stat, very high defense and very low stamina (130), making it the more easier to OHKO than Exeggutor and less potent in terms of total damage output. Leafon is more or less comparable to Sceptile. Roserade is also quite similar to Sceptile – high Attack, low stamina and solid defense will make Roserade a great glass cannon, especially if it gets Leaf Blade instead of Solar Beam. Mamoswine is an incredible addition to any Ice roster, with massive 247 Attack, 220 Stamina and 157 Defense and a resulting Combat Power of 3289. This is the definition of what a top tier entry looks like for any type. Mamoswine is the Tyranitar / Dragonite / Machamp of Ice types, overshadowing even Legendaries like Regice and Articuno. Glaceon and Weavile are your new Ice type glass cannons, with high Attack, low Stamina and solid Defense. We consider both of them to be better versions of Jynx and far superior to Lapras and Walrein in terms of DPS. We find Weavile also interesting as a potentially good Dark type, but more about that later. Hence, these two Pokemon are essentially filling the gap between Gen I & II Electric typed Legendaries and Jolteon. Both Weavile and Honchkrow are expected to perform better than Houndoom, due to higher Attack and in Hochkrow’s case more Stamina. Weavile will probably end up as a glass cannon and Honchkrow as a similar-to-Houndoom addition. We’re quite interested to see how these two will perform as Mewtwo counters. The post Generation 1, 2 and 3 Pokemon that evolve in Generation 4: a guide on important cross generational evolutions appeared first on Pokemon GO Hub.